Ross Maxwell Scenic Drive is the most interesting of the paved sightseeing routes in Big Bend National Park, giving the greatest variety of habitats, geology and a variety of interesting short walks and interpretive pull overs. Ross Maxwell Scenic Drive skirts the western slopes of the Chisos Mountains, climbing up to one the park’s most outstanding views at Sotol Vista, then winding down to parallel the Rio Grande at Castolon Historic District and winding up at Santa Elena Canyon trailhead, where the pavement ends. Heading south from the Ross Maxwell junction, there are a number of pullovers to interpretive sites, trailheads to short and longer hikes, and scenic vistas. Old Sam Nail Ranch – a short path leads to an abandoned old ranch building along Cottonwood Creek. Chimneys Trailhead- A 5 mile round trip moderate hike to interesting geological formations, or continue on to Luna’s Jacal on the Maverick Road, about 7 miles total. 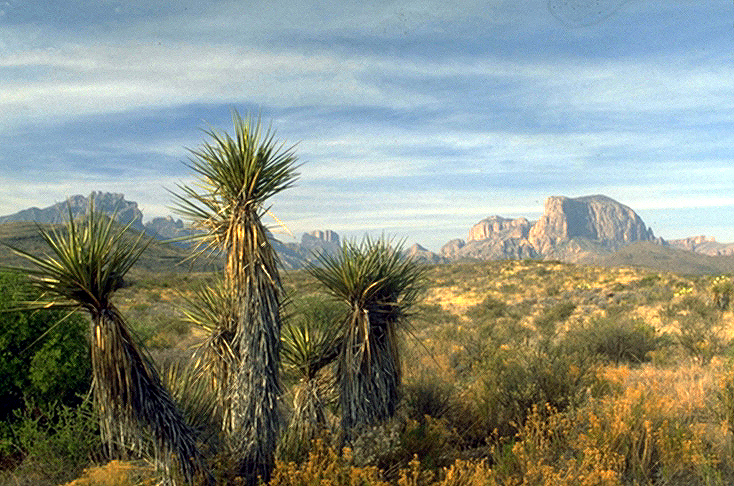 Sotol Vista – The view shown below is one of the best in the park. Burro Mesa Pour-Off – a 1/2-mile trail leads into a box canyon and a dramatic high pour-off. Tuff Canyon – a short trail leads to an overlook and inside the canyon itself. Castolon Historic District- Buildings from the early 1900’s farming community including an old store, troop barracks, and private residences. A small store offers cold drinks, snacks, lunch material, ice cream etc. Cottonwood Campground- Developed campsites with tables, running water, and chemical toilets, underneath shady Cottonwood trees, right by the Rio Grande. Excellent location for watching birds and wildlife. There are several pullouts with views of the Rio Grande, before arriving at Santa Elena Canyon, a Big Bend “Must See”. At this point, travelers may continue ahead on the all gravel Maverick Road 14 miles back to the western gate of Big Bend National Park, or backtrack on the paved Ross Maxwell Drive.